The Royal Hill of Ambohimanga is an archeological site that contains a ruined city, burial sites, and assorted sacred places. It is a place of religious and historical significance in the culture of the Malagasy people, and has been so for the last 500 years. Ambohimanga dates from the 15th or 16th century, and developed into the capital city in the 18th century. rituals take place on a daily basis.During the reign of the kings, mainly brown checkered Zebu cows were brought to the royal stables as offerings..nowadays its more on chicken, I was told. Once inside the royal compound, you will be shown the wooden house of the great king Andrianampoinimerina who.. reigned from 1787 to 1810.His majesty used to sleep much higher up than his 12 wifes who had to share one bed on those special days that they all came together to the royal palace from the neighbouring 12 hills. I was also told by the guide that High land people used to be much smaller at that time as there was more Asian than African influence.Therefore the 12 queens could share one single bed!Next to the kings house stands the summer house of the queens, Ranavalona I. reigned long 33 years and she was using this place as a retreat from Antananarivo where the capital has been moved to.With her was her French lover and architect Jean Laborde who was about the only foreign national admired by the queen, until 1847 when also Laborde was expelled because of his involvement in a plot to replace the queen with her son.Behind the burial place for the royals, you can find the small pool where the queen accompanied by 70 virgins used to take her bath.It was a great honour to come and work at the royal palace of Ambohimanga, even just as an ordinary slave.Not to miss the excellent view from behind the palace with Tana in the distance and the white mausoleum of the kings whichdoctor on an adjacent hill. If you are in Madagascar your prime objective is probably to see Lemur and the other unique ecological aspects of the country. The culture is interesting too having developed from the first immigrants – coming, not from Africa, but some 1500 years ago from the area of present day Indonesia and Malaysia. Meeting the people and seeing their way of life and rituals/ritual objects is also a major plus point for the country. Ambohimanga, the main “historic site”, is only 20 kms from the capital and should NOT be missed whilst you are there. By the time the British and French vied for control over Madagsacar in the 19th century Madagascar was ruled by a royal line of the Merina clan who came from the highland area around Antananarivo. Ambohimanga was their Palace and later, as Antananarivo became the capital, it in developed as the weekend retreat for the royal family. The place has a peaceful atmosphere made more poignant by the history of what happened to the royal family who used it. In 1890 the British eventually gave way to the French in return for a free hand in Zanzibar and the French invaded Madagsacar in 1895 eventually deposing the Queen and exiling her to Algeria. The family was never allowed to return by the French. The compound is beautifully set in green countryside looking over a rice paddy filled plain reaching back to Tana. The wooden buildings include a bedroom and meeting rooms plainly furnished with goods which include gifts from Queen Victoria. Outside there are pens for the royal Zebu. Pilgrims come to pray using the good offices of the spirits of the Queens. All in all a magical place! 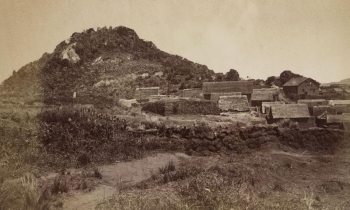 Forbidden City: Ambohimanga was henceforth considered one of the sacred royal hills of Imerina (the Merina kingdom) and was known as a "forbidden city" until 1897. Sacred Forests or Groves: "sacred woods consist of indigenous plants and, in a manner now absolutely rare on the Hautes Terres, represents in residual form the natural forest which once covered this and other hills"